Misremembering Life – Love. Life. Practice. There's a lot of hullabaloo recently about a reporter who misremembered some events during the Iraq conflict. Personally I tend to agree with the folks who rather bitterly point out that if the news media had been as careful with fact checking the actual buildup to the war as they are Brian Williams' story, many lives might have been saved…but I digress. The problem people have with Mr. Williams is that, frankly, they don't believe that he “misremembered.” How could you possibly recollect events that you didn't live through? Especially things that were so visceral, like being shot at by insurgents. It seems impossible – but that's only because, unlike Bryan Williams, we don't usually have people fact checking us. You know that great story you tell about your childhood? Odds are that if you went back and found someone else who was there – someone who has not been hearing your version of events over the years – they would have a pretty substantially different version of what transpired. Not necessarily more accurate – but that's the point, after all. What really happened is something that is imperfectly remembered by the human mind, at best. Daniel Simons is an expert on memory, and via the You Are Not So Smart podcast he explained that “…memory is not like a videotape that we play back in our heads. It's more like improvising variations on a theme.” You can also read more about the phenomenon in his Slate article, How Not to Be the Next Brian Williams. But that's not really what the point of this blog post is intended to be about. Rather, I'd like to share that you should be very glad that our memories are malleable, and that we have the flexibility to alter our memories – even the really intense ones – so completely. Not me and Grandpa. But pretty close. I remember when he said that I just set my jaw and nodded – not in agreement, but in acknowledgement of his view. Because I love my Grandpa, and wanted to make him proud. At the same time, I was not the image of a grandson I think he expected. It took a few years of visits, as a youth, to recognize the look of disappointment on his face when he'd ask me about some sporting event and learn that I wasn't actually a fan. I began studying up in the weeks before I'd see him, following events and games and athletes, and yes, he absolutely beamed the first time I was able to comment about a particular baseball play. But in some ways I was never going to be able to live up to what I thought were his expectations. I only lasted a semester at the University he and my parents approved of. I never made it to the missionary work that was so important to his religion. And in terms of that vision of family…that was never to be. At the time he talked about the Most Important Document I was freshly divorced with four infant children that I was struggling to raise as a single Dad. Ideas about gender roles and such pretty much just made me feel like a failure. As I said, I set my jaw and nodded because I respected and loved him, and didn't want to be more of a disappointment to him. That was pretty much the last conversation I had with him before he died; it's certainly the one I remember the most clearly. One of the hardest parts of being at his funeral was the feeling that when he died, he had still been disappointed in me. Facebook is a wonderful thing. I know, that's not a usual opinion of mine, but thanks to the social network I have gradually gotten better acquainted with a particular cousin of mine who I met, at most, a handful of times growing up. Our interaction is a good argument for the theory of genetic influence, as we seem to be amused by the same things and have the same impeccable sense of humor. …it was a personal choice not a requirement. This completely floored me and changed my outlook on what was expected of me. Why do I now get the feeling that I have you to thank for that? I don't know if I actually was an influence…but ever since I got that letter from him, that last sentence – Why do I now get the feeling that I have you to thank for that? – has been digging around in my head. Why? Because it implies that maybe I wasn't as much of a disappointment to my Grandpa as I feared. He certainly never gave me any indication – it was just something I assumed, because I couldn't live up to a set of words on a wall. 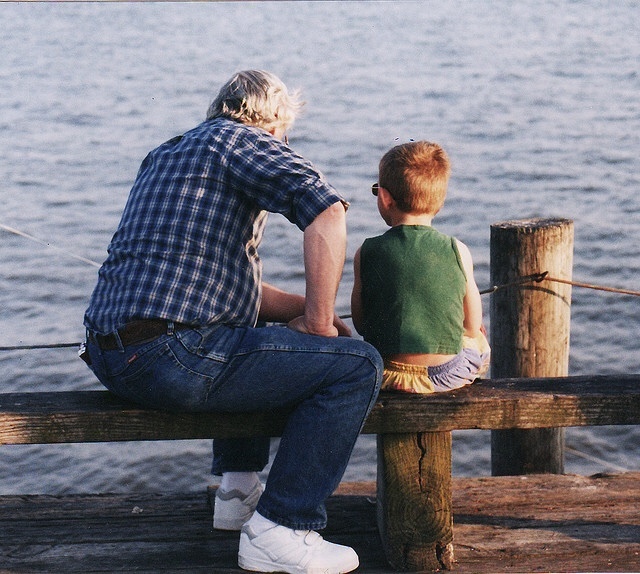 In spite of that, though, it is possible that my memories of what happened between me and Grandpa need to change. It's not a videotape, it's a theme, and suddenly, thanks to my cousin, that theme is completely different. It's hard for me to really express just how much those simple words affected me; the best I can do is say that it's such a huge burden lifted that I don't really have the chance to deal with it right now. I'm on a trip to do a performance at the Asian Art Museum, and while San Francisco coffee shops are known for their quirkiness, middle-aged men weeping into their coffee is probably pushing the limit. No advice here; just an observation about my life, and if you find it useful, I'm glad.